We have all been presented with the rather romanticised view of the venerable old alchemical philosopher huddling over his flasks of bubbling liquid immersed in his quest for the elusive philosophers' stone, a mere grain of which will change a mass of molten lead into the purest form of gold. 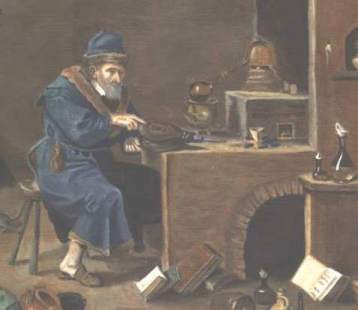 This image of the alchemist was one which developed relatively early on in the history of alchemy, but it became a very popular view in the 20th century and to most people this is almost all they know about the subject. Another view that developed was that alchemists were mysterious adepts belonging to some secret society and exchanging messages in a coded form. They were even seen as having paranormal powers which enabled them to do all sorts of magical things and live to an extreme old age. Thus alchemists became confused in the popular imagination with the image of the magician. These stereotypical views of alchemy do not really allow us to appreciate the breadth of alchemy and the various ways in which it inspired people over the centuries. This introductory section will, hopefully, let us gain a broader picture of this amazing subject. So how should we view alchemy? Alchemy is a multifaceted subject. It is an early form of chemical technology exploring the nature of substances. It is also a philosophy of the cosmos and of mankind's place in the scheme of things. Alchemy developed an amazing language of emblematic symbolism which it used to explore the world. It had a strong philosophical basis, and many alchemists incorporated religious metaphor and spiritual matters into their alchemical ideas. About four thousand printed books were issued from the 16th through to the late 18th centuries, exploring alchemy from a multiplicity of different perspectives. 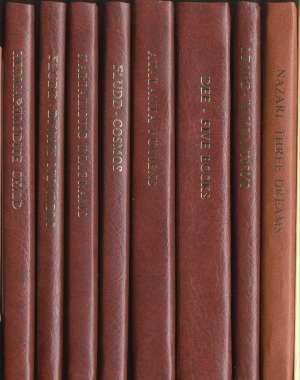 Many thousands of manuscripts, hand written works, letters, notes and commentaries exist in the libraries of Europe and North America, some beautifully illustrated with coloured images. Alchemy was thus, through the sheer volume of writings, influential throughout the early modern period. Its influence can often be seen in the work of writers, poets, and artists of the time. In the 20th century, interest in alchemy was revived, following its decline and total eclipse in the 19th century. Today alchemy is often used as a catch word for obscure and enigmatic symbolism, or for the idea of spiritual transformation and inner change. How is alchemy approached today? Some people today still actually try and perform alchemical experiments. Most of these people hope they can make healing remedies, though there are a very few amongst them who still think they can find a transmuting philosophers' stone. Most people who take an interest in alchemy use it as a source of philosophical and esoteric ideas, to support the particular belief system to which they have attached themselves. Thus they use alchemical ideas and symbolism as part of their interest in Kabbalah, or Tarot cards, or some esoteric or magical system. As alchemical ideas and symbolism are obscure and difficult to understand, such people feel free to adapt alchemical material to suit their agenda and prior intentions. Unfortunately, this has not led to a deeper understanding of alchemy itself, but rather to a mere plundering it for material to fit into an existing mindset and structure. Another group of people see alchemy as a part of depth psychology. They see alchemical symbols as archetypes existing somehow within every human being, and that alchemy can have the key to unlocking an understanding of the innermost and unconscious part of the psyche, which is supposed to be the main part of our being (using the analogy with the iceberg, 90% of which is hidden under the sea). Though this can be a persuasive and seductive idea, not everyone is able to accept such a view. The philosophical basis for this is a belief system that developed in the middle of the 20th century, and although it is contemporary and seemingly relevant to our lives today, this is, by its very nature, not something that can be proved, or even argued about, as it is essentially a belief driven system. Alchemical imagery is often used, almost as decoration, in books and on many websites, often associated with things and ideas to which these images have absolutely no connection. However, the emblematic imagery remains vital and inspiring, and is one of the main ways in which people enter into some appreciation of alchemy. A few modern artists have been inspired by alchemical material. A small group of people prefer to read the original writings of the alchemists, rather than relying on the many secondary sources, pseudo-histories and interpretations which flooded the bookstores in the latter part of the 20th century. Although alchemical writings are obscure and difficult it is very rewarding to try to read the orginal material in its proper context, freed from later interpretations and distorting commentaries. Alchemy can be seen as an important part of cultural history and can be explored in an exact and scholarly way. In the early and middle parts of the 20th century, alchemy was often a no-go area for scholars, however, the work of some key scholars in various disciples during the 1960's and 70's broke down the barrier of prejudice and nowadays many scholars study alchemy as they would any other cultural phenomenon. There is an active publishing of scholarly articles and books, and a number of key academic conferences have been held on alchemy in the past few decades.